I really wish I could give books half-stars. 4-stars doesn’t do this, and many other books justice, but I don’t give out 5-stars easily either. I’m sent prolly a dozen books to read each month. I don’t accept many, but I had read a previous book by Herbert, and I liked her style. However, when I opened the kindle file & found it was a Harlequin, I grimaced. I am not a sappy-romance fan. I remember my mom’s shelves & shelves of Harlequin books. I didn’t understand how she could read 2 of those a day. Not my thing. But, I said I’d read it, so I figured I’d chew through it. From the start of this book, I knew it wasn’t like those other Harlequin Romances my mom loved. This is part of the Harlequin Intrigue Series. It was more like a Cozy Mystery. I love cozy mysteries. They are quick reads that you can escape into without all the , “OMG, that would never happen in real life” cheezy stuff. So, if you’re like me, and the Harlequin name name turns you off, stop right there! It’s has a bit of romance in it but it’s not…. sappy. It’s sweet. After the first few pages I was hooked. I usually read a few chapters each night to help me fall asleep, but last night I found myself still up at 3am reading. Woops! I could easily see the characters in my head, and the story moved at a nice pace. I like books that are visual, and that are detailed, but aren’t too wordy. 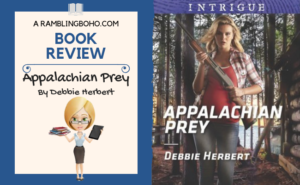 Appalachian Prey definitely fits the bill. There were a couple hiccups that popped out at me, but overall, this is a really good read. I recommend who likes some light mystery with a little second-chance romance thrown in! Star-crossed lovers on Lavender Mountain…Danger awaits them both. After her father’s murder, pregnant Lilah Tedder dreads facing deputy Harlan Sampson, her child’s secret father, who left her heartbroken. Though she still wants him, Lilah knows his professional ambition won’t let him associate with a moonshiner’s daughter. But when a killer targets Lilah, Harlan becomes more than her protector. Now they must uncover old family secrets or pay the ultimate price.